The 3300-sqft multi-generational house is designed to be durable, energy efficient, comfortable, bright and regenerative. The house is a bungalow, with easy access to the house and yards via ramps, making it possible for residents of all ages to use the building with ease and elegance. 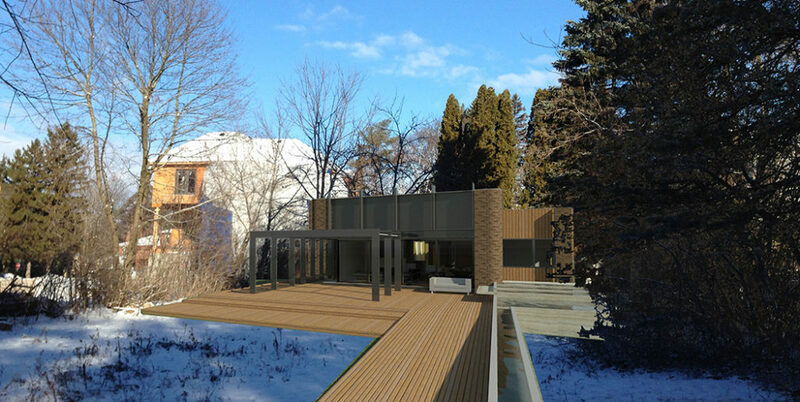 Because it is designed to the Passive House Standard we will be able to achieve Net Zero energy use with Photovoltaic Panels (PV) on the roof and are looking at incorporating a Tesla Powerwall as a backup energy storage in case of power outages. The clients are a family who want a space which is high performance and has a strong connection with the environment and nature. They want their home to integrate with the site, and promote biodiversity and abundance. The design has a constant physical and visual interaction between the user and nature. Opening the back sliding doors and the front skylight will provide an enjoyable cross ventilation in the warmer months, while lounging and socializing on the south-facing patio, beneath the grape covered trellis will create functional, comfortable summer space, even beneath the hot mid-summer sun. In winter, the thick insulation, triple-pane windows, and the high-efficiency energy recovery ventilator will keep the indoors comfortable and fresh. By moderating and modulating the micro-climate around the home, we are moving from a binary “inside” vs “outside” to spaces they can use throughout the year. It is an integrated design incorporating permaculture principles throughout the project.